I’m not sure how cold it is where you live, but we can get as cold as -50°C. When it gets that cold here, there’s no way I’m leaving the comfort of my warm house to go out in the cold! If you prefer the warm indoors as well, I have some fun indoor winter date ideas that won’t require you to brave the cold outdoors. 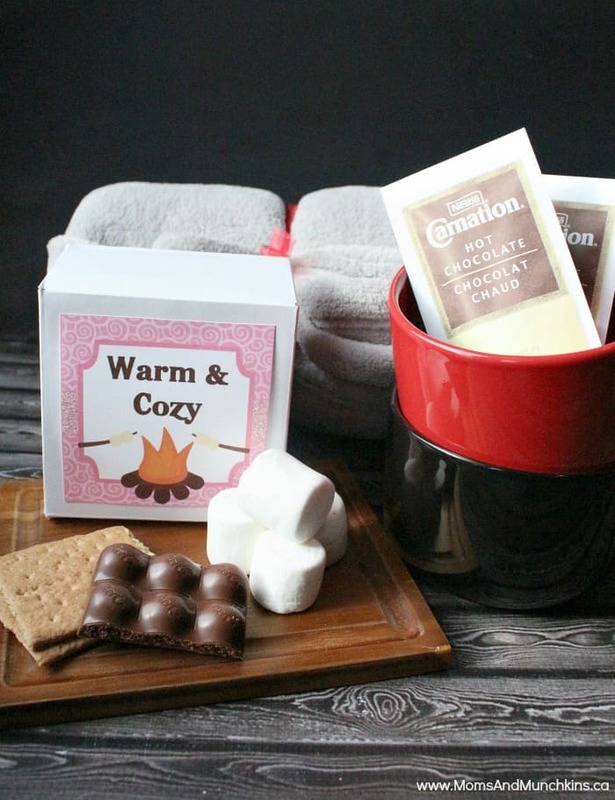 Plus we have a free Warm & Cozy printable you can use to make an indoor winter date kit with indoor s’mores, hot chocolate, mugs and a cozy blanket. Plan a Romantic Dinner for Two: There are a few different ways to do this depending on your cooking skills and time. One option is to order in food from your favorite restaurant. Another option is to try a new recipe and cook your loved one a special meal. The other option is to choose a recipe together and have fun preparing and cooking it together in the kitchen. No matter which option you choose, you’ll want to set the scene with nice dinnerware and candles. Movie Night: A great way to stay warm indoors is to set up a comfortable area with blankets and pillows (beside a fireplace is perfect!) to enjoy a movie together. Board Games: You can make an evening of board games romantic by setting the games up on a coffee table by a fireplace and playing by candlelight. Fondue Night: As far as romantic desserts go, not much compares to strawberries dipped in chocolate! You could have a cheese fondue with vegetables and bread for supper and end the meal with a chocolate fondue with fresh fruit and marshmallows. Homemade Hot Chocolate and Cookies: A fun activity would be to make your own homemade hot chocolate (these recipes look delicious) and bake some cookies to go along with it. What are your favorite indoor winter date ideas? Do you enjoy being in the outdoors during winter or do you prefer indoor activities? 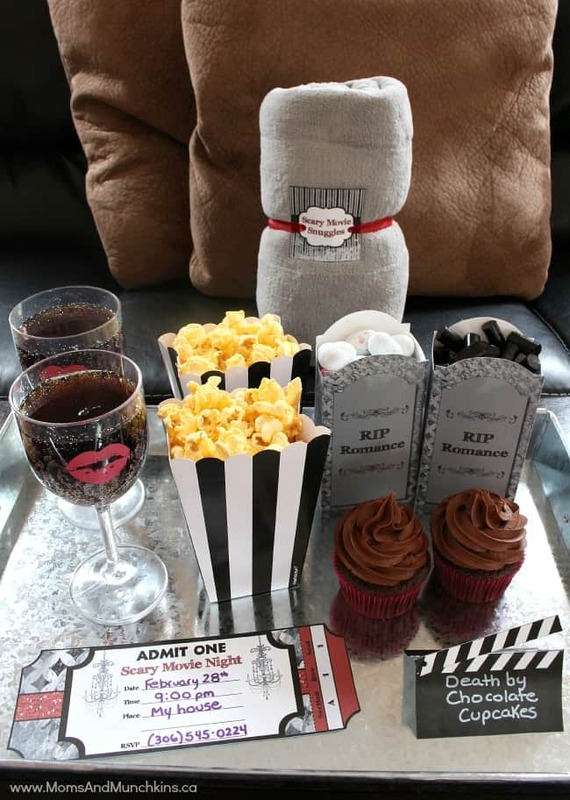 Visit our Date Ideas page for even more ideas like this fun Scary Movie Date Night! Stay updated on the latest ideas by following us on Facebook, Twitter, Pinterest with sneak peeks on Instagram. *Special thank you to Wendy’s Printable Party for designing the tag for us plus © Emily Reece Designs, MNINEDESIGNS, and Erin Bradley Designs for the clipart & digital paper. we love our fireplace, it kinda turns any night into date night! lol it just makes the room so cozy! Well, I know what my husband’s idea if an indoor date lookalike. Curiously it’s not on this list!!! JK. Ha! Paula…I knew someone was going to go there. Ha! HAHA @ Paula’s comment. That would be my hubby’s idea too! Love these ideas! Great post for a day like today!